This is the fourth article in a series on Traveling With A Disability: Traveling with Blindness. The introduction to the series (and an index) can be found here. In this article we will be specifically addressing traveling with blindness or severe vision loss. We recommend traveling with assistance. Being a fully independent traveler can be a little trickier overseas, especially if a foreign language is involved and you have fewer auditory cues. Warning signs and other visual guidance will be missed without a companion or local tour guide/informant to tell you. Overseas, if you don’t already have local friends to assist you, you will find less accessible pedestrian signals, often unimproved sidewalks (or no sidewalks), more erratic traffic and crowded streets, and even motorbikes using the sidewalk as an extra lane depending on your destination! Cobblestone sidewalks and roads, while quaint, can make it difficult for blind people to get around. Most places simply won’t have intersections like we do. In our Top Three Risks When Traveling Overseas, we reported that traffic accidents (getting hit by a car) are one of the top causes of both fatalities and travel insurance claims for those going abroad. Traveling solo shouldn’t be an issue, especially if you are in the USA and Canada, but in this case, is was. If you have already experienced life in Italy or India or Indonesia, you k now that red lights and traffic signs are just a suggestion. Drivers will create additional lanes, and bikes and other conveyances seem to be everywhere. One suggestion is to ask directions ahead of time. Especially for routes that will keep you off busier roads, away from traffic and that may not be as crowded/dangerous. Of course, busy streets with at least frequent traffic can also be your friend, as they can provide you with a great parallel and proper places where it might be safe to cross. More about how to avoid being a victim in our free guide here. You can take a friend or family member overseas with you, just make sure it’s someone you trust and who’ll be able to guide you and help navigate the unfamiliar locations. Even if you decide to go solo, it can be helpful to have someone show you around for the first part of your trip so you have a clearer idea of where everything is. Always carry a card with you listing any disability or impairment in case of accident or emergency. In case of accident, always carry I.D. and a medical I.D. card along with your travel insurance medical ID card on your person at all times when overseas. The back of your Travel Insurance Medical I.D. card will have a 24 hour worldwide emergency phone number anyone can call in case of emergency. 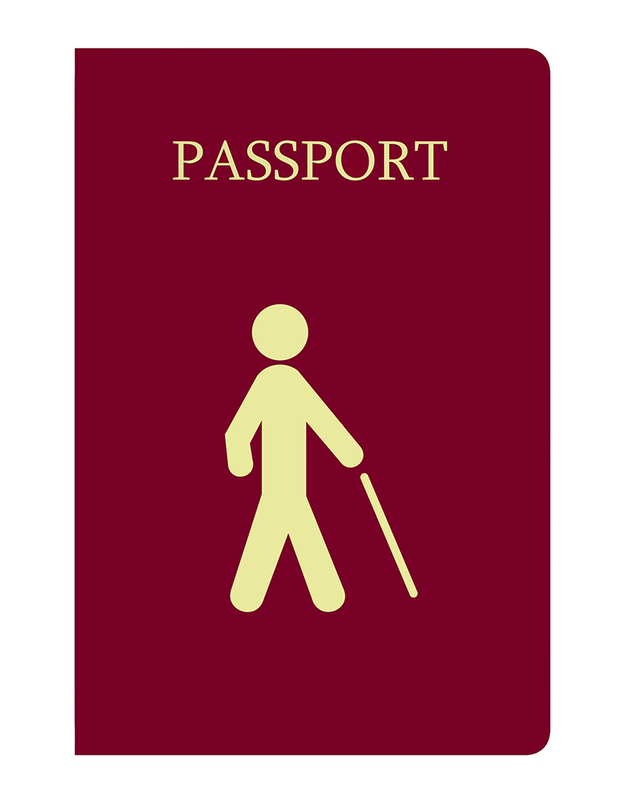 You should also carry proof of your disability/blindness from your doctor or state/government (More about this later as it can also secure free benefits overseas). Unlike the free Medical I.D. below which is for notification alone in case of accident or unconsciousness, “A medical certificate” is basically documentary proof of illness/disability from a registered doctor or medical practitioner stating your condition, usually on letterhead and in their own handwriting. A medical certificate is generally regarded as irrefutable proof of your stated illness or injury. You can create a free medical I.D. card here: www.medids.com/free-id.php. Include “Blind” or “_% Sight Impaired” Include the name and phone number of your physician as well as a loved one they can contact. 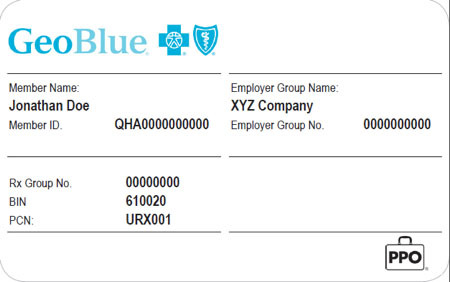 Include your Medical Insurance information on the card in case of accident. If you need a travel medical insurance recommendation, you can call us using Skype at “good neighbor insurance” or call 866-636-9100. Two plans we would recommend are the GeoBlue Voyager Choice (includes pre-exisiting conditions) or the IMG Patriot plan. If you plan to stay overseas for up to a year or more, you might want to consider the GeoBlue Xplorer plan. You can also go with a tour that will make sure you have just as spectacular a trip as anyone else. One blind-specific tour is Traveleyes. They take a mix of blind and sighted on their trips, the latter acting as guides and describing the sights to those who can’t see them themselves. You could also choose to join a “slow walker tour,:” which isn’t limited to the blind, but is for anyone who needs to move more slowly than the average sightseeing tour. BlindSquare and Google Maps are both great apps that can help with at-the-moment spoken information about where you’re at and where you’re going using GPS. More suggestions at http://www.miusa.org/resource/tipsheet/blindiphoneapps and on our recommended travel app page at https://www.gninsurance.com/essential-travel-apps/. TapTapSee can also be a great help as long as labels are in English or you are looking for general descriptions (It is limited when looking at object labels in other languages such as items in a grocery store). Check this review. If you have a four-legged companion and would like to take them overseas with you, check out these resources from Mobility International USA. You’ll need to check on required documentation and vaccinations for a service animal based on your destination and local laws. This can take weeks or even months. In some situations, it may be illegal to import a service dog into the destination country without a quarantine process. Dogs aren’t as widely accepted overseas as they are here in the U.S., so make sure you research the local cultural opinion on dogs before making any decisions. Be aware that in many countries dogs are considered unclean, are not let into houses or shops, are often treated with cruelty. Many people may be very afraid of them being too close to them. If you do travel with a guide dog, however, here are some good air travel tips to help you, your dog, and those around you to be as comfortable as possible. Consider packing an emergency medical kit for your dog. dogs get sick overseas too, esp. due to unclean water and food they might eat along the way. An upset stomach or problem with diarrhea will be unpleasant for both of you. Make sure people know that you’re blind. It may not be obvious especially in lines or crowds or if those you are dealing with are preoccupied. 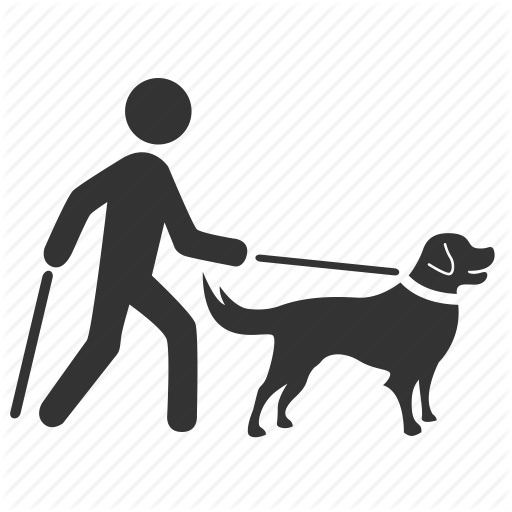 If you have a guide dog or cane with you it might be obvious, but let them know regardless. Hotel and airline staff will be able to assist you however needed – if not needed, tell them so! Most people are unsure of how much help you need. Don’t be afraid of asking for help! Rubber raised “stick on dots:” from Home Depot or your local hardware store can help you find your bags at the airport, you can also tie a bright scarf or other distinctive item onto your bag so that others can help you to locate it quickly from all the other bags. Tactile paving is something that has been appearing throughout North America, Europe, and Asia. 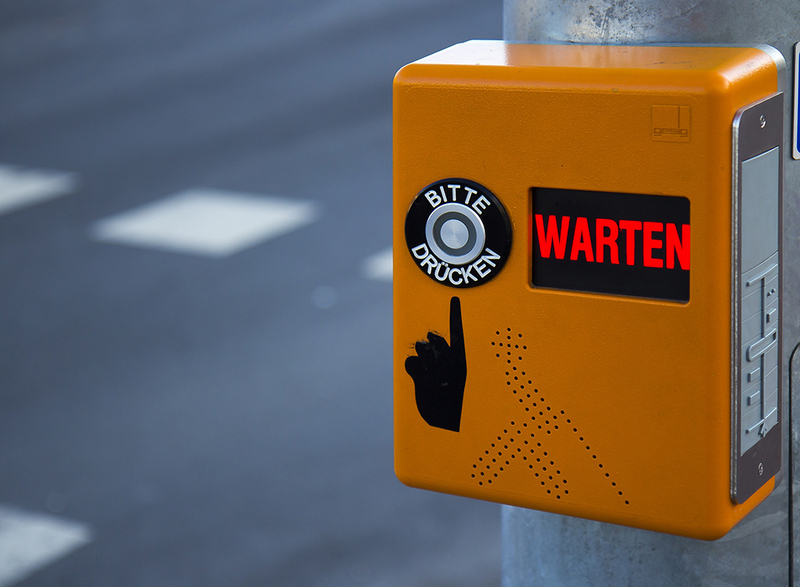 It can be extremely helpful for the blind as they navigate the streets, but it can also be very dangerous. 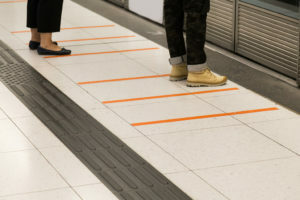 If not done right, tactile paving can be potentially confusing and can lead to danger unnecessarily. One good thing about foreign travel is that most countries have currencies with different sizes depending on the value of the bill, this makes it easier for the blind to sort and use. Once you’re at your destination, get familiar with the layout of the local area. Whether you use large print directions to navigate, or get someone who knows the area to show you around, you should have a good understanding of where essential places are. Also be aware of places you can get equipment repaired / replaced in case of damage or loss. A new culture takes some getting used to for anyone. Here’s a story from a blind traveler and her experience with the new culture. If a different language is spoken, you’ll want to find an interpreter or a good translating phone app to be able to communicate effectively! 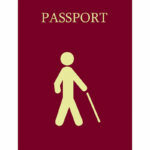 Even if you don’t normally use a cane, it is suggested that you carry one, as it’s an international sign of blindness. Again, don’t be afraid to ask for help. People are more than willing to assist you with anything you might need. It may be challenging to maintain your independence as people feel “sorry for you” and seek to help you do things for yourself. In many countries, people have been culturally trained to make decisions for the blind or disabled. They can be hidden away or maybe reduced to begging if their family cannot support them. Unfortunately these local stereotypes can also affect how you are treated. Realize that most people you meet will not know what to do with a disabled person. Depending on your destination, you may need to be prepared for squat toilets instead of western sit-down porcelain toilets. These can be especially hard to navigate for the blind, however larger hotels and bigger cities may offer both styles or western-style toilets. You may need someone to describe how the flushing mechanism works. 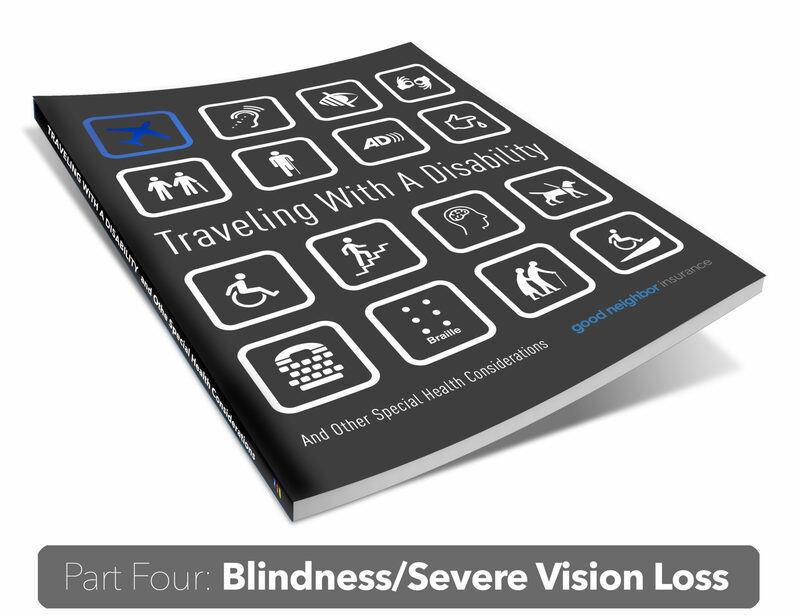 Read this article from the Society of Accessible Travel & Hospitality about blind travel. Consider the amount of local spoken English if you do not speak the local language. This is especially critical due to your additional dependence on verbal cues/instructions. Get used to asking because you will find uneven use of Braille on signs, esp. for bathrooms in restaurants, etc. The subway ticket machines and other signs may be in braille; but can be in Italian braille or another language since they don’t have standard English contractions. In one way, travel abroad may be easier than daily life in the U.S. depending on your residence – People in Europe and in many locations around the globe rely much more on public transportation (even local taxis) than owning cars. Public transportation systems are more common, and often better planned than in the USA where they might seem an afterthought to the freedom of automobile ownership/private transportation. I have also heard that in Paris, not only do the disabled person get in to museums and Versailles free, but “a companion,” will sometimes get in free as well (See the Louvre here). Proof of disability or entitlement may be required such as a Primary Medical Certificate or disabled person’s parking card, although most travelers report that proof was not demanded of them when the disability was obvious. You can also see the Vatican free (although the tours are not free). London Taxicard for registered blind and partially sighted people living in London. When traveling abroad, always make sure you and your travel companions always purchase good, affordable, travel medical insurance such as the GeoBlue Voyager Choice plan. If you are a frequent traveler, you might want to consider the GeoBlue Trekker Choice plan which is an annual plan that covers unlimited trips overseas. Both cover pre-existing conditions as long as you have coverage in the USA. If you are healthy/well, and do not need the pre-exisiting condition benefit, consider the IMG Patriot Plan here which will save you a little money or call us at (866)636-9100 for more advice on the best plan to fit your needs/destination. https://tactiletheworld.wordpress.com/ – A blog by a very experienced DeafBlind traveler who also serves as Director for Nepal Deafblind Project. Let us know in the comments below what tips you would recommend and articles you have found helpful. If we missed something, we’d love to edit this article and improve it so everyone can benefit. We’d also love to hear your own stories of traveling with blindness.